Recently, almost the entire staff of the Pioneer went to lunch in the cafeteria simultaneously. This is a rare occurrence, as we are usually too busy with our various projects to go to lunch together. Our lab assistant elected to have a pizza covered in jalapenos. Afterwards, while outside indulging our shared nicotine addiction, he complained that the jalapenos hadn’t been hot enough for him. Why does any of this matter? Well, it reminded me of one of the many, many stories about my grandfather. James “Pa” Bradley was a man’s man. Six foot two, built like a Mack truck, and with all the charm and “good ‘ol boy” humor of Cary Grant. But, much to my Nana’s chagrin, he often got himself into humorously dangerous situations. At one point, Pa was working with a construction crew to make some extra cash. At the time, Mexican food was still exotic, and many of the condiments and foods we take for granted were rare, or unknown to the average American. 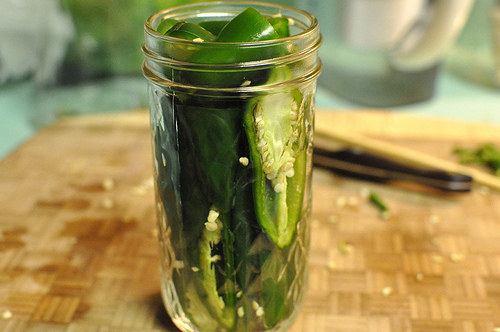 At lunch, Pa sat down next to one of his co-workers, a gentleman of a Mexican persuasion whose wife had packed him a treat from home for lunch that day — a jar of pickled jalapenos. Now, unlike the average jalapeno that you see in stores today, these were huge; six inches long, fat and heavy with spice. And Pa, having never seen a jalapeno up to that point, promptly decided they were some weird form of pickle, and asked for one. His co-workers immediately tried to dissuade him, warning him they were not for the faint of heart. Being a man’s man, Pa scoffed, grabbed one, and shoved the entire thing in his mouth, chewed and swallowed. Predictably enough, his face caught fire. Hilarity ensued as Pa promptly did the worst thing possible, and chugged his glass of water. His co-workers, laughing themselves sick the whole time, helped him walk the few blocks home, where he proceeded to run inside, and down a pitcher of water. By this time, Pa is beet red, gasping for air, and Nana is freaking out because she thinks he’s having a heart attack. But, being the sensible woman she is, she eventually figures out that he has eaten something spicy, and gives him a glass of milk. The best part? Pa developed a taste for “them Mexican pickles.” He just made sure to have a glass of milk on hand before he ate them, and never again did he eat an entire jalapeno in one go.